The Louise Rick and Camilla Lind series pairs a police detective with her friend a freelance journalist, and this particular investigation centers around the death of a woman who supposedly died years before while in the care of a home for mentally challenged children. Both Rick, who recently joined a new division of the police to solve old cases, and Lind, her friend the freelance journalist, interview people surrounding the crime, which broadens to an investigation of a number of unsolved disappearances, assaults, and more. This is an action-packed book, and the writing was fairly decent. My only hesitation in recommending it is that it’s difficult to jump into the series at this late point. I felt a bit removed from the main character of Louise Rick because she has quite a rough backstory that obviously has affected her deeply. I’m not sure that any part of her past was normal, and that makes her seem a bit unbelievable to me. Believability at the end was also a concern for me. It’s a book with a horrifying story based in reality (the mistreatment of mentally challenged individuals in institutional settings), and in that ways it reminds me of several other Danish books I’ve read in the last year. This is a good read, but it’s not the best entry to the series. It seems I’m returning to series I liked this month–or at least this is the second book in the row that meets the criteria– and I enjoyed Invisible Murder, the second installment in the series featuring Nina Borg, a nurse who moonlights as a nurse for refugees in Denmark. Her work with the Network not only endangers herself, but it has exacted a huge toll on her husband and family, and this book is no exception. The story centers on two young men who are Roma from Hungary, the younger of whom tries to sell something dangerous to a buyer in Denmark and implicates his brother, a law student on the verge of graduating. The story of Tamas and Sandor is the most affecting part of this book, and I was more invested in their plights than I was in Nina’s. Kaaberbol and Friis also create other sympathetic characters, including the aging investigator Soren Kirkegaard and retired building inspector Sklou-Larsen who has a rocky marriage to a much younger woman. I’m not sure why they don’t portray Nina as a bit more sympathetic: she’s pretty single-minded. I enjoyed the first and final thirds of the book more than the middle (the second third wasn’t very mysterious to me): the first section told Sandor’s story, and the last section was very brisk as the case came together, but that is my only complaint about the book. I’m not sure why it took me over two years to get back to the series: I’ll be seeking out the rest. Other reviews appear in EuroCrime, Reactions to Reading, and International Noir Fiction. I’ve skipped books two and three in the Department Q series not because I disliked the series or the first outing in the series, The Keeper of Lost Causes, but just because I’ve been reading other things. After reading this interesting interview with Adler-Olsen earlier in the year, I thought I may try the series again, and while I enjoyed this outing, I have a few reservations. 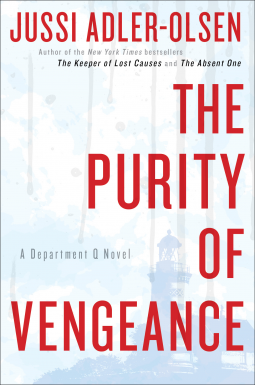 The Purity of Vengeance involves Mørck, Assad, and Rose investigating a cold case involving a missing brothel owner who disappeared over twenty years before. The other timeline in the novel involves the life of Nete Hermanson, a woman who kills her husband and tries killing herself in the early pages of the novel as a man she meets at a party threatens to expose her past life. Nete’s past is the main focus of the story. The old missing persons investigation intersects with Nete’s story, and there are connections to ultra-right-wing politicians as well. Finally, the novel also advances the plot of Mørck’s wounding in a prior attack that left one of his fellow officers dead and another paralyzed. Thankfully, Adler-Olsen juggles the plots well, and the pace is fairly brisk. My reservation with this book is the same one I had with The Keeper of Lost Causes: the crime Department Q investigates in this one is another one where women are horribly treated in myriad ways. In the first book it was an indictment of one crazed killer and his torture of a female politician, and in this, book four, it’s an indictment of a large group that was responsible for forced sterilizations of a large number of women. It’s heavy subject matter, and I feel strange saying that the book was written well or that I was interested in the ongoing storylines of Mørck and Assad when the main plot was so horrible to women. I hope not all books in this proposed ten-book series are as brutal to women as this one is. I’ve been on a Scandinavian crime kick for the last six months, and this is the best book of the lot I’ve read. It’s also one of the best books, period, that I’ve read in a very long time. Almost always I find something that annoys me about a book: a section, a storyline, a character that feels out of place or just not real. I loved the characters, the pacing, and the tone in this book. Seriously, I have no complaints. 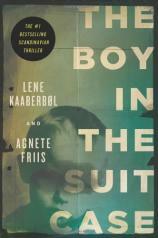 Nina Borg, a self-described burnt-out social worker and a Red Cross nurse discovers the boy in the suitcase, three-year-old Lithuanian Mikas, in a parking garage near the Copenhagen train station. It’s a gripping beginning. The story cuts from character to character involved in this kidnapping tale: Nina, wealthy business executive Jan Marquart, Mikas’s mother Sigita, and, finally, the villain Jucas. The characters are real, complex people, and there is no idealized superhero among them. All the characters have interesting histories that do not let them off the hook for the not-so-great things they’ve done. Nina, for example, is a nurse who devotes her all to the refugee children in her care but can’t devote herself to her own children. Also, the main antagonist Jucas is not just a steroid-fueled monster,which is saying quite a lot for a villain in a thriller. Even the characters that we see just in passing are interesting, like Jan’s wife Anne. The pacing of the story is great too, probably because the chapters are fairly short and alternate from character to character. Since this is not a typical police procedural or private investigator novel, there aren’t slow sections of witness interviews either. Finally, I don’t feel manipulated emotionally by this book. It’s dark subject matter: kidnapped foreign children living in Denmark. And making the missing boy so young could be seen as a ploy for sympathy, but somehow I don’t feel yanked around by melodrama. The story doesn’t feel sensationalized. I haven’t read many Scandinavian crime novels. I started with Stieg Larsson and read a few Wallander books by Henning Mankell, and I was a bit leery of venturing further into Scandinavian stuff. Larsson’s books are quite gruesome for me, and I was mentally exhausted by the end of every Mankell novel. He isn’t easy on Wallander at all, and the outlook is pretty grim. Thankfully, Detective Carl Morck and his assistant Assad aren’t nearly as depressed as Wallander. That’s not to say that Morck is a light and cheery guy: he has a pretty severe case of PTSD and has issues with the Copenhagen police bureaucracy, but that’s common in police procedurals. This novel is the first in the Department Q series by Adler-Olsen. Morck and Assad are the two employees of th edepartment charged with investigating cases requiring “special scrutiny.” Translation: they deal with long-open cases that are somehow high-profile. Their first case is the mysterious dispearance and presumed death of Member of Parliament Merete Lynggaard. There are two other investigations occurring in this book: the recent murder of a cyclist and the less recent murder of one of Morck’s colleagues. The plot was good but not overwhelmingly intricate, the characters ar einteresting as well, and, best of all, there are some light moments between Morck and Assad. Is Denmark just less dreary than Sweden? I’m very much looking forward to book two.